If you know me, then you know I love cookies. L-O-V-E I could easily eat myself sick with cookies and keep eating them. 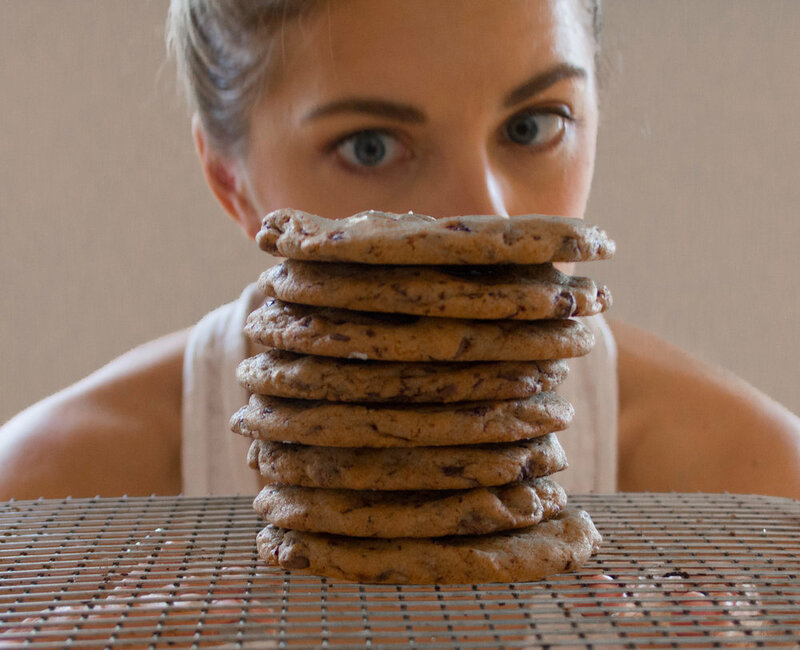 Zero cookie self-control. If you really know me, then you know my fave is chocolate chip, and more specifically salted chocolate chip. There is a cafe in Berkeley, CA, Elmwood Cafe, that began my love affair with the healthy sprinkle of sea salt on my giant, soft chocolate chip cookie. They are so good. So good. Not nearly enough salted chocolate chip cookies for one sitting! When I moved to Boston, I obviously lost my source of salty sweet delight so I have been on the hunt for a recipe that would get me close to the perfection of Elmwood. Well, I have found it! I have taken Smitten Kitchen's Salted Chocolate Chunk Cookie recipe and adapted it ever so slightly for the texture I was looking for in my ultimate cookie. Smitten Kitchen actually took the recipe from Not Without Salt and mixed it with the recipe from a version in the Date Night In cookbook. As you can see it's a long chain of connections to get to my recipe, and the changes are ever so slight. Take this as a lesson in baking though: Don't be afraid to make changes to a recipe. It may take some trial and error to get to exactly where you want to be, but it's fun to experiment and the end result is always pat-on-the-back satisfying. Sometimes you need a good base to work off of to get to where you want to be. In my recipe below, I use bread flour instead of all purpose flour. I will go into the difference between flours in another post to come soon, but the gist of it is that bread flour has more protein resulting a slightly denser and more structured cookie. The cookie won't spread like you would expect so I actually formed them into the thick disc shape I was looking for before I baked. This gave me a soft cookie all around. No fear of crispy outer edges on these guys... and just for the record sometimes I want the crispy edges, but for my perfect Elmwood replica I did not want to risk it. The second thing I did was mix the chocolates. I did half milk chocolate and half 85% dark bitter chocolate. This gave a variance in texture and taste. Sweet but not sickeningly so. The super dark chocolate has no added sugar so helps to really highlight the salty crunch on top. The last thing I did was use salted butter (Kerry Gold to be exact) and dropped the added salt down to just a pinch. I wanted most of the salt to come from the top sea salt but didn't want to lose any flavor in the cookie batter. I think these small adjustments got me to exactly where I wanted to be. Professional Tip: always make one small cookie for a chef's taste sample. I ate the whole rack of Salted Chocolate Chip Cookies, but just saying this might help you with protion control. Sometimes the smallest taste of home can ease some of those homesick stomach pains. Glad to have these in my war chest of Bay Area restaurant hacks for when I need a little comfort. Preheat the oven to 360*F. Line a baking sheet with parchment paper or a silicone mat. In a mixing bowl, beat together the room temp butter and both sugars until light and fluffy. Add the egg and vanilla and beat until just incorporated. Mix in the baking soda, salt and flour. Stir in both chocolates until worked throughout the batter. Scoop out a ball of dough and form into a thick flat discs and line on baking sheet an inch or so apart. 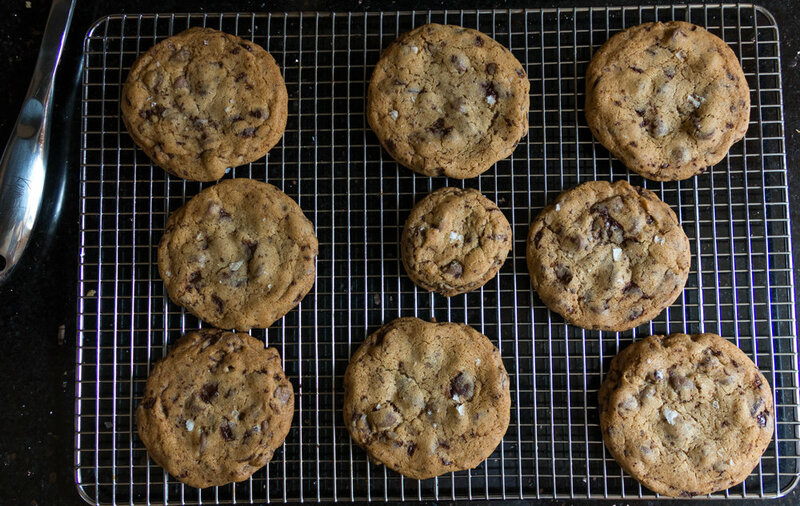 Sprinkle the top of each cookie with the sea salt and bake for 10-12 minutes (rotating half way through baking time). Allow to cool slightly on the sheet for a minute, then transfer to a cooling rack to finish cooling. Store in airtight container.